Looking at David Jacob’s stats from 2017, and one might get the idea that his season came easily for the up-and-coming star. But what his .274/.335/.446 slash line in 168 at-bats doesn’t tell is the way he had to work out of some adversity in Lansing to find success in the Midwest League. Falling in place it did, as Jacob recorded 21 hits in 73 at-bats with the Lugnuts, while supporting a .796 OPS in his short stint in Lansing. Prior to joining Lansing, Jacob appeared in games for the GCL Blue Jays, Vancouver Canadians, and Buffalo Bisons in 2017. 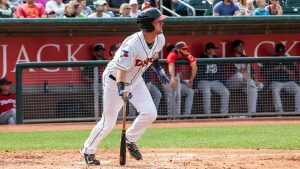 As expected, Jacob is especially fond of his brief stint in triple-A ball, as he got a taste of how the higher level minor leaguers handle their business on and off the field. Jacob feels his success at the plate comes from keeping his approach simple since turning pro in 2016. Despite his repetition as a reliable hitter, Jacob is also a solid defender that didn’t commit a single error at either first base or right field last season. Playing primarily at first, Jacob took part in 20 double plays, while assisting on another 11 in his 200 innings at the right side of the infield. Putting an emphasis on this area of his game during warm-ups, Jacob discusses the practicing techniques he used to have a solid season in the field. Blue Jays fans certainly hope that David Jacob can continue to find consistency in both phases of the game, as he makes a push for more playing time at higher levels in upcoming seasons.